Prez Bhandari visits various shrines to observe Maha Astami - Integration Through Media ....! KATHMANDU: President Bidya Devi Bhandari on Wednesday visited various shrines in the Kathmandu Valley to pay homage to goddess Durga Bhawani to mark the Maha Astami, eighth day of the 10-day-long Bada Dashain festival. President Bhandari visited Guiheshwori, Maitidevi, Kalikaisthan, Bhadrakali, Naxal Bhagawati, Shova Bhagawati, Naradevi, Sankata Bhagawati and paid homage to the goddesses. The priests of the respective temples offered prasad to her. 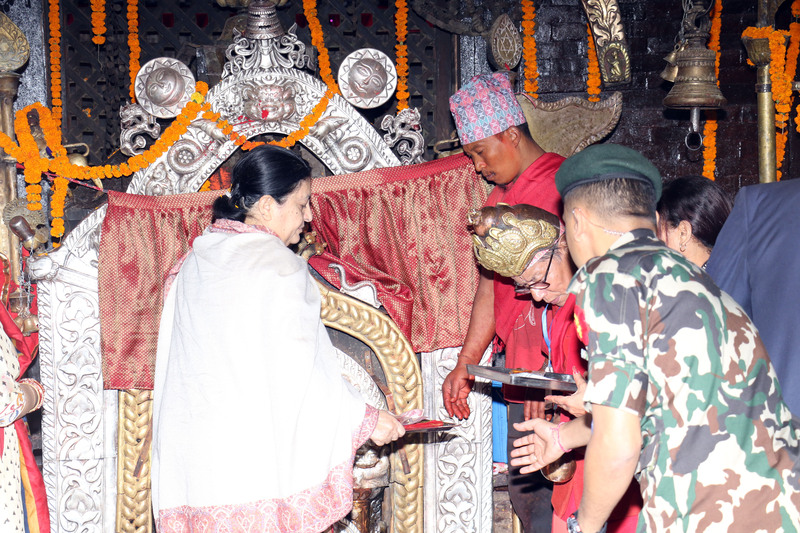 Earlier in the morning, the Head-of-the-State had paid obeisance to the goddess at the Palanchok Bhagawati Temple.